Think what New Testament scholars would give to have access to a single letter that Mary wrote about the raising of Lazarus. We have many such documents that relate to the Restoration of the gospel in our dispensation. Opening the Heavens records hundreds of accounts of divine manifestations relating to the Restoration—events that strengthen our faith and expand our knowledge of Church History. Did you know for instance, that there are ten recorded accounts of the first vision from the lifetime of Joseph Smith? That there are seventy-one documents that deal directly with priesthood restoration? 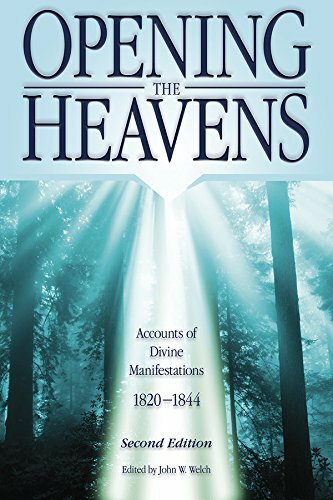 This volumes brings together, for the first time, all of the known documents from Joseph Smith’s lifetime relating directly to key events of the Restoration that were accompanied by divine manifestations. These first-hand accounts uniquely convey the spirit of these important occasions and provide precious details that help modern readers construct a vivid image of what transpired. Many new historical resources have become available since the first edition of Opening the Heavens. Newly discovered testimonies have been added to this second edition. Many hours have been spent in updating the footnotes, especially to the Joseph Smith Papers Project. This valuable collection offers remarkable access to the earliest historical sources. The ebook version of the second edition includes live links to online resources that contain images of original documents and information about their creation.